This FDA-approved patient information booklet was developed for health professionals to give to parents of children being treated for otitis media. Using the theme “Your Child Is Counting on You,” the program addresses the fact that up to 80% of antibiotics prescribed for children with middle ear infections are stopped prematurely by parents. 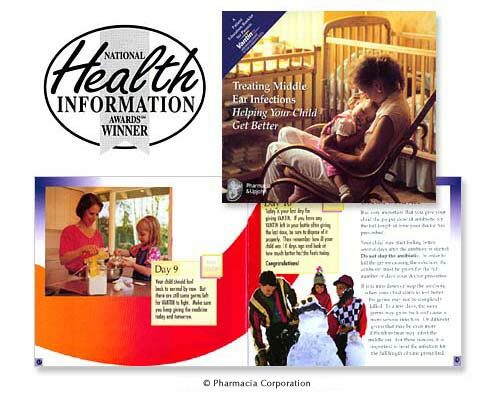 Consumer Health Information Corporation handled all aspects of the project including development of the patient adherence strategy, integration of behavior modification techniques; content and translation of medical terminology into patient-friendly language; development of patient adherence tools, design that met patient education requirements and printing. Click here for more information about Patient Compliance Programs. Here’s why our clients keep coming back. We offer thousands of practical tips from our clinical practice that have been proven to help increase proper home use of medications. We know how to apply patient compliance research to a specific disease, medication or patient population. We know how to evaluate the product’s Package Insert and predict the potential patient compliance problems that can be expected to occur with that medication. Because of our clinical experience, we have learned how to develop effective patient compliance programs that target children, parents, adults, caregivers, the elderly, the terminally ill or a specific culture. We know how to teach patients to manage common side effects … so they do not stop their treatments prematurely. We know how to skillfully integrate patient instructions for the medication with diet, exercise and lifestyle. One of our skills is the ability to simplify medical illustrations so they are “consumer friendly” – and still clinically accurate. This helps our clients receive speedier FDA approval. If your product is for a chronic therapy, our experts know how to develop a progressive patient education program.